Have you reached a milestone or have a special announcement to pass along to family and friends? 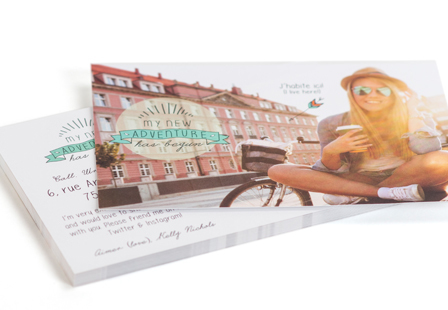 We’re here to help with our custom uncoated invitations and announcements. Printed on premium 14PT uncoated card stock, they allow you to easily write on them with a pen or pencil without smudging. Great for weddings, graduations, baby showers, birthdays and so much more! Keep your guests up-to-date for any occasion. Choose from a variety of sizes and printing options including the option to select blank envelopes. Paper: 14PT Uncoated Card Stock. Coating: Both sides of the cards are uncoated and easy to write on. Please Select 4.25" x 5.5" 4.25" x 6" 5" x 7" 5.5" x 8.5" 6" x 6"